It takes a lot to surprise Jay Kornegay. As the sportsbook director at the LVH (formerly Las Vegas Hilton) sportsbook, Kornegay’s seen it all during his eight years at the helm of the city’s bellwether operation — and made money for the casino in the process. When you run a book with the widest variety of futures and proposition bets available while simultaneously releasing those lines before anyone else in Vegas, you normally end up taking a lot of action. When we talked to Kornegay this past week, though, it was the absence of action on one particular line that shocked him. And that’s just one of the five fascinating tidbits we took away from our chat with one of Vegas’ foremost bookmakers. 1. Nobody’s bet on the Charlotte Bobcats. Nobody. The LVH is renowned for having futures bets available before anyone else, so degenerates like myself descend on the book regularly to try and find a long-shot championship or conference championship winner before anybody else. And after the Mavericks followed years of disappointing playoff performances with a title win last season, it seemed like a sure thing that NBA long shots would be bet heavily in a weird, shortened season. Well, some of them have been. The Charlotte Bobcats simply have not. That’s right: Not a single person has gone up to the betting windows at the LVH and plunked down the $5 minimum bet on the Bobcats to win either the NBA championship or the Eastern Conference championship. Sure, you can point out that the Bobcats are currently 4-27 and 11 games out of the final playoff spot in their conference, but nobody even wanted to bet five bucks on them to win before the season. Not even one Bobcats fan went to Vegas and said, “Hey, maybe I’ll go throw five bucks on my favorite team.” Their odds to win the title are currently at +9999 (meaning that a $100 bet would return $9,999 in profit), and the only reason they’re not higher is because the LVH’s computers don’t allow a five-digit line to go up on the board. Kornegay couldn’t remember the last time that happened. 2. A lot of people are betting on the Los Angeles Angels. This one isn’t really all that shocking. After adding Albert Pujols and C.J. Wilson this offseason, it’s no surprise that the Angels would be among the favorites to claim this year’s World Series, but Kornegay noted that there are “far more” tickets on an Angels World Series at the LVH than any other team in baseball, with the line going from +2000 before free agency all the way down to +800 today. Kornegay chalked that up to Vegas being an Angels town, noting that Vegas always gets a disproportionate amount of action on the L.A. teams. In the past, that money usually went toward the Dodgers, but after that team got McCourted, the status quo is no longer the case. On the flip side are the Mets, who opened at +5000 and are now at +15000. 3. The book made a small profit on the Super Bowl, even though the combination of a Giants win with the under was its worst possible outcome. The Giants haunted Vegas’ sportsbooks during their run to the championship, as they were heavily bet in each round of the playoffs. That wasn’t a huge deal at home against the Falcons, but they got plenty of action on their moneyline (straight-up bets on a team to win or lose, regardless of any spread) as underdogs in each of their final three wins. The ticket count was lopsided toward the Giants for most of the two weeks preceding Super Bowl XLVI, but a number of big bets came in late on the Patriots to even things out. There was no such luck for the point total, as just about every book in the city opened up with a total around 55 points and saw steady action on the under push that figure down to 53. A 21-17 final meant that the game only resulted in 38 points, giving the public a nice win there. 4. Every sportsbook director in Vegas hated that safety. In our preview of the prop bets available, we scoffed at the idea of a safety and noted that betting against a safety was one of the best decisions you could make. Oops. Of course, when Tom Brady threw a pass to an invisible receiver on New England’s first attempt of the game, he made a lot of bettors happy that they put down some money on those +900 odds. Bookmakers were not quite as pleased. As Kornegay noted, “People come to Vegas to bet on things happening, not against them.” The vast majority of the action on that bet came in on the safety occurring, which cost the books a pretty penny on a bet that almost always goes in their favor. In addition, they had to pay out longshot winners on a safety being the first score of the game and on the Giants’ first score of the game coming by safety, which was a +10000 proposition. And yes, while nobody on planet Earth has bet on the Bobcats winning the NBA title this year, somebody did bet on the Giants scoring their opening points of this year’s Super Bowl with a safety. The LVH’s profit on prop bets ended up coming thanks to the same low score that paid off so many “under” bettors. With no shockingly great performances and a lot of slightly below-average yardage totals, gamblers who were mostly taking the over on player propositions didn’t hit on very many of them. 5. The LVH can’t win a coin-toss bet. Over the past few seasons, the LVH has failed to turn a profit on a bet that should go its way. The opening coin toss of the Super Bowl is a fool’s bet, a chance to gamble on a true 50/50 proposition without 50/50 odds, as the -101 odds dictate that a $100 bet would only return $99.01 in profit. Assuming that half of the gambling populace thinks the bet will be heads and the other half thinks that it’ll be tails, the bet should return a slight profit to the LVH over the long run. The reality, though, is that the gambling public does not end up going with a 50/50 split. For some reason, the public favors a bet on heads over one on tails, meaning that the book will usually turn a profit when a coin toss comes up tails and lose money when that same coin falls on the other side. This was backed up by the Papa John’s poll where the public got to pick heads or tails for the coin toss with a free pizza on the line, in which 60 percent of voters chose heads. You can see where this one’s going. For the fourth straight year, the Super Bowl coin toss came up heads. Vegas lost on the dumbest bet in the book. Again. And that wasn’t even the most exciting story to come out of the coin toss, as New York’s failed call of the coin meant that the AFC won the coin toss for the first time in 15 years. The odds of one conference winning the coin toss 14 consecutive times are 8192-to-1, or +819200 in proper Vegas parlance. Hey! 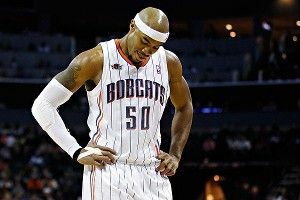 We finally found a bet that made a Bobcats NBA title run look likely. We’ll be reviewing the LVH book in March as part of our coverage of Vegas’ second-biggest sports betting event of the year: the first round of the NCAA tournament.